Acne is a common skin problem which is also sometimes called pimples or breakouts. It can manifest at any age on the face, neck, back and shoulders. They occur when the body’s natural oils (sebum) and old skin cells together block the skin’s pores. This causes inflammation of the skin. Acne can be mild, moderate or severe and is caused by over production of sebum in the sebaceous glands of the skin. At the same time, old skin cells are not being shed properly and they clog the pore. In combination with the excess sebum, the pore becomes blocked forming blackheads and whiteheads. The acne bacterium p. Acnes is present on every skin, usually harmless, causing no problems. However, in people prone to acne, the build up of excess sebum and old skin cells creates a sticky environment in which thIS bacteria can multiply. This sets oFf inflammation within the skin creating raised angry spots and cysts, sometimes filled with pus. Diagnosis of acne usually doesn’t require testing but by observing lesions and when/where they occur on the body. Hormonal changes are usually the risk factors for acne from puberty, pregnancy and hormonal changes due to periods, polycystic ovary systems or medication. 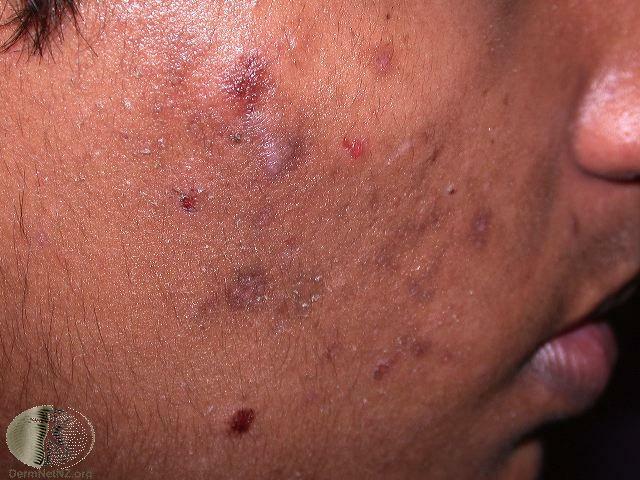 Squeezing, popping and using irritants can make acne worse and lead to scarring which is a problem for skin of colour. Treatments is usually aimed at clearing existing acne and to tackle the source of acne. There isn't a cure for acne, but careful management of skin health can keep it under control. It is also very useful to look at lifestyle factors that exacerbate acne e.g. sleeping in make up. Treatments often include topical retinoids, topical antibiotics or oral isotretinoin. The antibiotics treat infections that come from severe pus filled acne and vitamin based oral isotretinoin help reduce oil production. In clinic treatments such as chemical skin peels, laser and LED light treatments are also beneficial.